This is part of a series of articles on games in Vienna, Austria. There’s a summary post here if you want an overview of games in the city. On my previous visits to Vienna, Crime Runners had been my favourite venue, with three high quality games that showed their continued improvement from a well executed but relatively straightforward debut room to a more technologically advanced experience with thematic puzzles. When they announced that they were planning on opening a fourth experience, I knew I’d be heading back to see how that trajectory had continued. The new game has required them to find a new venue, which is a little less central than their original location. That’s a shame, because it may put off tourists who would otherwise be tempted to make the trip. Once inside, though, it’s clear that the trip is going to be worth it. The immersion starts before you even enter the game – showing you the outside of the kiosk where your story begins. Attention to detail on the outside of a room and a desire to start the experience as early as possible is almost universally a good sign and, when you consider that the game itself is up to ninety minutes long, it’s clear that they’re aiming to make this as full an experience as possible. First impressions are good. Going Underground breaks you in gently, delivering a beautiful opening scene that sets a high bar for the experience. As the game progresses, the settings change significantly, but that high standard is constant throughout. 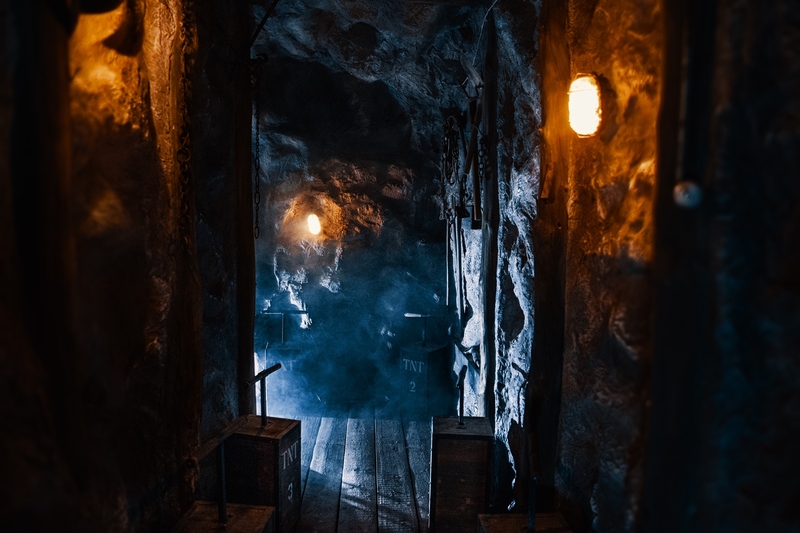 As some of the photos on their website show, the room sees you descending beneath the streets of Vienna, and the cave-like backdrop they’ve produced fully immerses you in that world. It’s that focus on immersion where this game really stands out, and it’s not just that it starts early and keeps improving throughout the experience: it’s also the way that you physically move through the space. To really absorb yourself in this adventure, you need to feel isolated from the outside world, and they managed to achieve that through a variety of techniques. Firstly, it’s a huge space – far, far bigger than a typical escape room – and that allows them to take you literally deeper into the game. On top of that, they’ve added interesting transitions, with each one feeling like it’s cutting you off from the world behind. And, with each major transition, you encounter a new and interesting set that ensures you’re focusing on what’s in front of you instead of what you’re leaving behind. Finally, they twist the game back and forth in a way that helps you lose all sense of direction. By the time I’d finished, I had no idea where I was relative to the start and, when I saw the layout of the game afterwards, I was genuinely surprised to see how simple the space actually is. This game felt like it was first and foremost an adventure, with puzzles being used to push you forward within the story. If puzzles are the most important part of escape rooms for you, then you may find this game a little light considering that it’s ninety minutes long. That’s not to say there aren’t good ones on offer, though: I thoroughly enjoyed the vast majority of challenges that the game threw at us, and only once did I feel slightly frustrated. The highlight for me was an audio puzzle where they’d managed to make it feel genuinely tricky while still creating something that most teams will be able to complete without help. In fact, that was a recurring theme: several of the challenges felt like they weren’t trivial but would still be solvable by beginners without help. More than most, Going Underground feels like it’s trying to cater for the experienced enthusiast while not alienating first-timers. It’s not just on that front where the game will appeal widely: it’s also got plenty of variety when it comes to the puzzle types and experiences you’ll encounter, with perhaps a slight bias towards the more physical in order to fit better with the story. During the game, it felt very much like the puzzle flow was linear, and I ended up playing alongside my teammates more than in a typical room. Looking back, though, I can see that there were often parallelisable challenges – it’s just that we chose to work together. I think in part that was because so often the game was made up of cooperative puzzles that it left us with a natural tendency to collaborate even when it wasn’t necessary (although the fact that my teammates were the excellent Stefan and Alex from Two Bears Life probably also helped). If you’re going to create a true adventure, then obviously story is key and, once again, Going Underground delivers. Telling a story in a timed experience is always tough, but the narrative here comes across before, during and after the game on many different levels – via puzzles, by the actions you take in the room, and through a small amount of reading, audio and video. They manage that rare feat of telling more than a simple story without confusing the players. They even manage to (loosely) connect it with the rest of their games. Before you know it, the game reaches its conclusion with a challenge that will involve the whole team, regardless of whether you go in with three people or the full complement of six. The finale to their previous game was a source of frustration for some players, and it’s clear that they’ve learned their lessons. Here they ensure that everyone’s involved, that they provide a good ramp-up of difficulty and that they avoid over-penalising players for mistakes. Some may feel it’s a little bit “computer gamey” but, surprisingly, it manages to fit well with the theme. It doesn’t quite end there, though: there’s one more, simple, challenge before you get to the last element of storytelling that brings the game to a fitting conclusion. Going Underground is a fantastic game which delivers ninety minutes of adventure and places Vienna firmly on the escape room map. It’s a game with no weak areas – the decoration, the story, the puzzles, the sense of exploration, the transition between rooms and the special effects are all impressive and, when combined, it’s hard to imagine someone not enjoying this game. If you’re ever in Vienna or get the chance to go, then find two or three friends and book in – this is an amazing experience that will stay long in your memory. If you want to read my reviews of the other Crime Runners games check out this article. Or head to this post for the Vienna escape room summary.